My neighbors are moderately nice people. They didn't utter a word when I doused a part of their lawn along with mine with a weed killer and burnt their grass in the process. I haven't yet hollered out to them for dire help but they oblige every time I call up and ask them to peep & check if I have shut my garage door. Theirs is an Indian family of grandparents, parents and a little daughter. Of all of them I am most thankful for this little girl who is the exact same age as Big Sis S. Big Sis S can pop over to their place pretty much any time and is always welcome, so is their little girl in my house. True to her nature Big Sis S also devours unfamiliar food with much joy at their house. Auntie (the grandmom) is a fantastic cook. The only problem is she doesn't understand Hindi or English and I don't speak their language, so communication is difficult. She sends over Dosa and Idli and unknown-to-me fried goodies, cooked at her place and taught my Ma to make the perfect fluffy Idli. How my ma communicated and got the recipe I don't know, but I have learned to not ask for the recipe or re-create anything she sends over and instead just enjoy the delicious food. The only teeny-weeny problem in this scenario is what do I do with the empty plates. My Ma had always taught us that a plate, bowl, whatever that had been filled with food should never be returned empty and so I feel obliged to reciprocate by sending back the plates with some edible items. However what little I know of them, I have gathered that they are very traditional when it comes to food. They rarely, very rarely eat out and enjoy only their kind of home-cooked food. I have sent some of my food over before but have never received any kind of acknowledgment and I didn't want to burden them with stuff they will probably never eat. My over enthusiasm might put a stop to future Dosas and vadais and idlis I felt. So I usually send store bought Indian Sweets. A week back we again got a supply of soft Masala Dosa and a fabulous chutney. We weren't going to get Indian Mithai anytime soon and I had a tub of Ricotta. So I thought of making a quick sandesh, framed on a recipe I got from here (Oops this was the page that had the recipe, I don't see the page anymore). I am usually lazy and have no time to make Chena(home made paneer) and then the sandesh, so this was a quick shortcut which I loved. Still no acknowledgment but the sandesh(or sondesh) with carrots or gajor sandesh are a quick fix delicious dessert for lazy souls like me and for maybe many of you too. My Ma would scoff at this and say I could have as well mixed ricotta with condensed milk and have it as it is, because anything with Condensed Milk is bound to taste good. But then again I am no puritan and neither is this recipe for such souls. In a microwave safe bowl mix 1 cup Ricotta Cheese with 1/2 cup Condensed Milk and 1/2 cup of Mawa/Milk Powder. Add a little cardamom powder or rose essence. After I had cooled it and cut in squares I wanted to top them with a layer of Gajar Halwa. Didn't have enough grated Gajar though and so microwaved 1/2 tsp of Ghee in a microwave safe bowl for 20 secs. To that added 1/2 Cup grated Carrots and microwaved for 1 minutes. Next added 1/2 Cup Condensed Milk to it and microwaved for 2-3 minutes. Some kheer kind of thing was created which was used to top the sandesh. Trivia: Bengali sandesh or sondesh is famous all over the world. But there is one more sandesh famous in Bengal, it is "Sandesh" a popular Children's magazine started by UpedraKishore RayChowdhury (among the first proponents of children's novels and books in Bengal), grandfather of Satyajit Ray. Later Sukumar Ray and his son Satyajit Ray along with their family members Lila majumdar and Nalini Das revived this magazine. Since almost everyone in the Ray family were excellent story tellers and authors of children's books(Sukumar Ray and Lila Majumdar being my favorite), this magazine was a treasure of literary gems. More from wiki. I ve seen only few strictly veg people (probab more ortho) never taste any outside food, if they know we are non_veg eater they even don't dare to drink plain water. But the new generation are quiet flexible, they usually don't bother even if u place a bowl a chicken next to sambar in party table. If they didn't acknole... are all ur stuffs reaching the bin? Gal, I wish I was ur neigh to taste ur sandesh and acknow the next second itsef! Very quick and easy recipe! They are not vegetarian, they make yummy biryani !!! But when I have talked to Uncle what I understood is that they don't even eat Dosa, Idli in a restaurant because they feel food cooked at their own home is the best and no doubt Auntie is a great cook. They only order out for pizza they say. 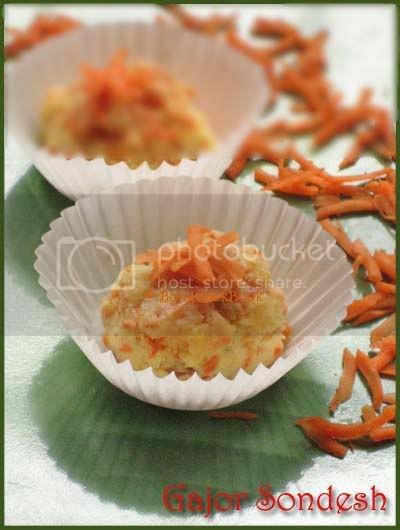 I love gajar halwa and liked this variation on sandesh. My gran used to be that orthodox but its rather unusual to find this today. As for not returning plates empty, I have that "thing" too. Just returned my neighbour's plate after a month!! How lucky you are to have such a wonderful neighbor. I'm not good at making deserts... this looks really easy. I'm going make it for my next dinner party!!! Yahoooo Spring is here. Have a happy weekend. sandeepa..yummy food and how nice to have lovely neighbours! i also make gajar halwa with rocotta...there is a recipe on my blog too...but honestly urs is so much easier!! i love mawa and anything made with it. my mom still says how i used to eat copious amounts of milk peda even as a kid! Have you asked them if they liked what you sent? Ask them once. Why take all the effort to make something and not appreciated. May be you should buy them some flowers or may be few plants occasionally instead of giving them food. Gajar Sandesh looks yummy, waste if they are chucking them out!! Next time, send the plates back with a thank you note. They do similar thing here too. I invite Indian couples and treat them like royalty, they never invite us and next thing you know, they move out of town without even a phone call to say goodbye. I have stopped inviting anybody now, why bother to put up with all the nonsense, I feel. 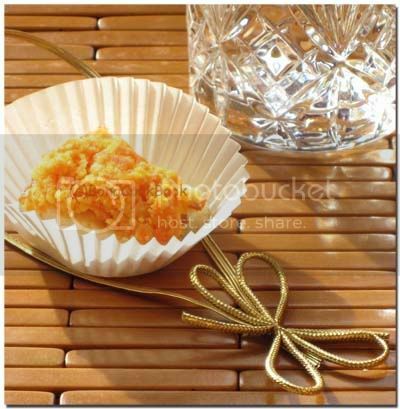 Sandeepa, this sweet is lovely. I get the freshest juiciest carrots from the Amish market and it will be perfect. I made my neighbor bisi bele bhaath a long time ago. I got back the bowl with a couple of apples and a plate full of pedas. I returned her plate with pongal. Now I have another bowl of hers which came with some yummy fruit cream. I kind of like this food exchange, it is always fun for kids when they eat food that is not cooked by their mom!! So I am thinking what to cook to return the bowl. It just might this beautiful sandesh. But my neighbor actually acknowledges with comments about the food, so I know she is tasting it, would be hard to be in the dark. I actually quite like Asha's idea of giving them a thank you note and probably gift them a flowers and plants instead of food. you are really lucky to have nice neighbours..Sandesh looks delish! I like the First pic..
1. i have now cracked it - i only come here when my stomach is full. i just had the most mind-blowing rasogullas from a bong mithai shop. so now i can stare at the gajor sandesh happily. smart choxbox. 2. is this sukumar ray the same guy who wrote a book called abol tabol. saw it today and wasn't sure how it'd be so didn't buy it. if you know of it, please to tell. 3. is there a vacant house between your house and your neighbour's? i'd like to move in. sandesh with gajar looks divine,..loved the irst click a lotz,..thnks for the links too..
it is a tricky situation, though. i like asha's idea about the flowers, or fruit even. that sandesh looks so gorgeous! you know i bought a bengali cookbook ('the calcutta kitchen') mainly because of the sweets in it? :D i've only made am kheer from it so far, ehm, but i made it more than once and every one loved it each time. i wanted to add that i found it very interesting to read about the custom of not returning an empty plate. though i can see it could be pressurising, it does seem a very nice custom, warm and friendly. it's like an extension of hospitality. i like it. I think your neighbours are also lucky to have you.It is a pity if all this deliciousness is not getting consumed. Wish u were MY neighbour..sigh! wow Sandeepa! This looks gorgeous! Shall try it out one of these days. Ki darun recipe eta sandeepa.. I kono mishti barite korina.. but my hubby just loves & craves bong sweets.. amr beshi khete entu hoyena.. tai kora o hoyna. I reaally need to start trying out! this looks considerably easy, no mess on the stove. i wish i had ur neighbors:-) some traditional people do not develop the taste to enjoy any other cuisine.. or i have seen some people are not in the habit of acknowledging anything at all! for your suggestions. The neighbors are indeed nice people. I understand their need to stick to their own kind of food. I have Bong Friends who will never try a Bisi Bele Bhath how much I insist. I myself am not too excited at the prospect of eating a eggplant parmigiana. Can't access your profile !!! this sounds way better than any store-bought mithai. Tomar "mango pudding" bhangiye koto je hath-taali pelam!!! Beautiful! that's one beautiful sweet - thanks for posting. BTW, I can't find an email to send you the links to the video and article. Please email me at peppercornmill@gmail.com. Thanks!